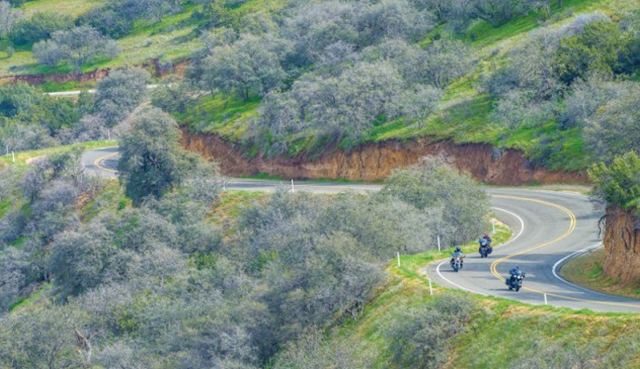 This article contains content fully attributed to Rider Magazine and their writers. Click here to read the article on their website, and for more exclusive info from this go-to moto news source. Harley-Davidson, Indian and Moto Guzzi are three of the most storied brands in motorcycling. Each has origins dating to the early part of the 20th century and a rich history filled with racing victories, engineering and styling innovations and iconic motorcycles. Harley and Indian built motorcycles in the 1930s that defined what a cruiser should be, with a big V-twin, a low seat, a wide handlebar and a laidback, feet-forward riding position. Despite being Italy’s oldest motorcycle company, Moto Guzzi is no stranger to American-style cruisers. 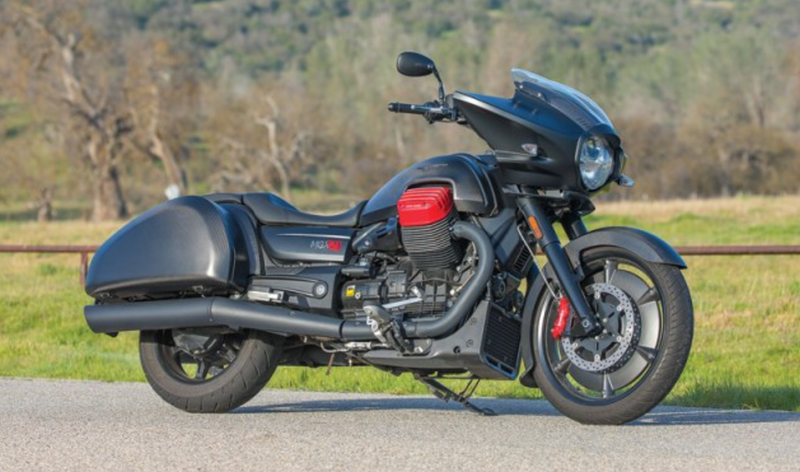 It’s been making bikes such as the California, Ambassador, Eldorado and Nevada for the U.S. market since the 1970s, and Guzzi’s current lineup includes five cruiser models. 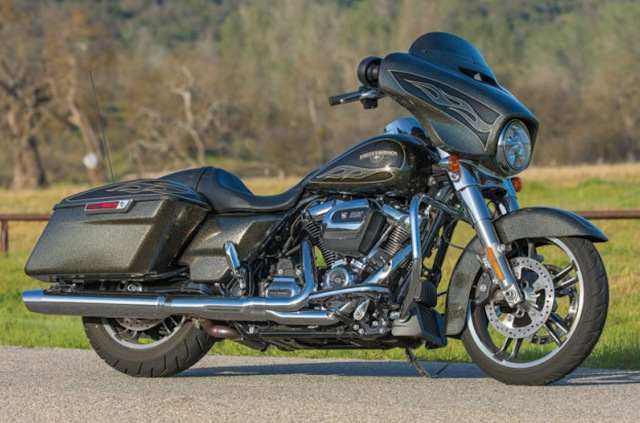 Read Rider Magazine's Road Test Review of the 2017 Harley-Davidson Street Glide. All three baggers have handlebar-mounted hard fairings with short windscreens, but only the Indian’s is electrically adjustable. With no fairing lowers, the rider enjoys wind protection only from the waist to the shoulders. 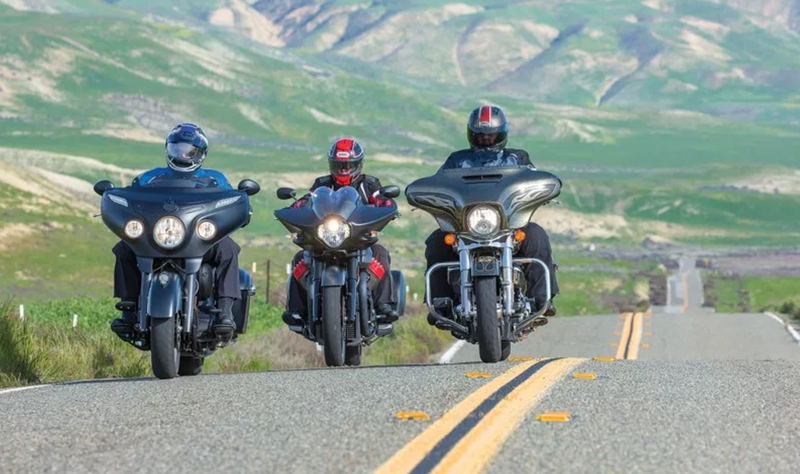 These three baggers are not run-of-the-mill cruisers. Each offers a different spin on the idea of a factory custom. This particular Harley-Davidson Street Glide Special is bedazzled with a Hard Candy Black Gold Flake paint job that adds a cool $3,000 to the sticker price. 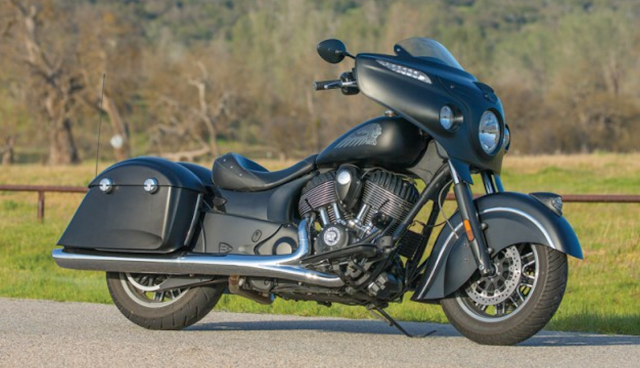 By way of contrast, the Indian Chieftain Dark Horse is a stripped-down version of the Chieftain that’s matte black from stem to stern and costs $2,000 less than the standard model. And for something completely different, there’s the Moto Guzzi MGX-21 Flying Fortress, a bagger seemingly designed for Batman with sharply pointed wing tips on its fairing, a big 21-inch front wheel and carbon fiber on the front wheel, front fender, gas tank and saddlebags. Our test riders take a break to discuss the bikes’ handling characteristics… and more importantly, to decide on where they want to go for lunch! How these bikes look while leaned over on their sidestands is important, but also a matter of personal preference. We’re more interested in how they perform out on the road, so we packed their saddlebags and headed into the hills for a couple days. We recorded our subjective impressions and applied our usual weights and measures to determine how they stack up as touring machines. 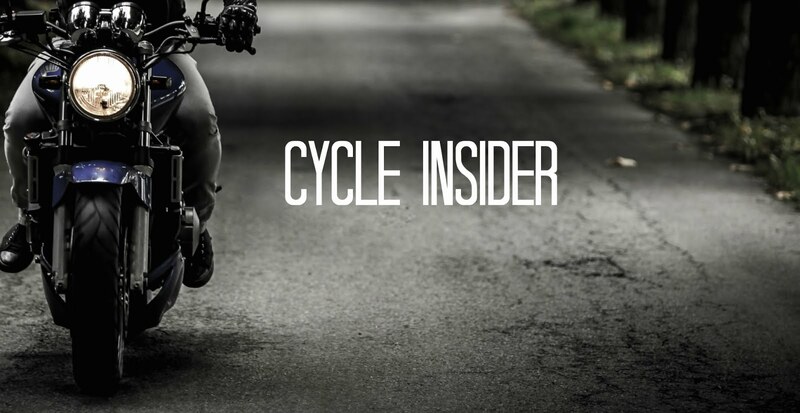 You’ll find the nitty-gritty details about each bike in the sidebars, dyno graphs and spec charts. Read on to learn about the bikes’ relative strengths and weaknesses and to find out which one came out on top. Nothing beats a ride in the country during springtime! As seen on the Moto Guzzi in the foreground, all three bikes have audio systems built into their fairings. 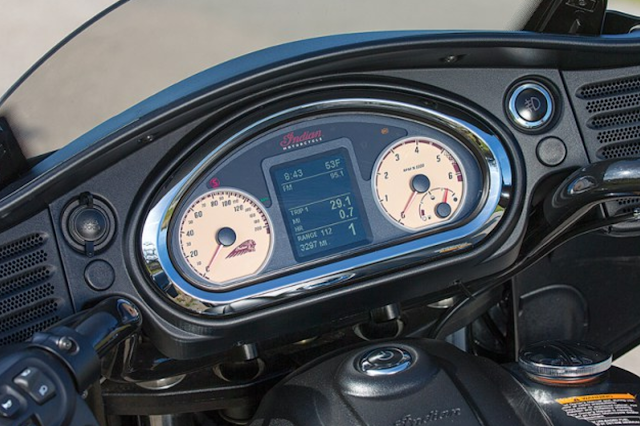 We found the small, sharp-edged buttons on the Moto Guzzi’s right and left switchpods difficult to use. Functional differences between these three became readily apparent before we even left the parking lot. In terms of packing space, saddlebag capacity is similar for the Harley (65 liters) and Indian (69 liters), both of which have top-loading bags that can be opened and closed with one hand and left unlocked; the Indian has the added bonus of remotely activated locks. Although the Moto Guzzi’s saddlebags look big, they hold just 58 liters, their interiors are shallow, their side-opening lids are inconvenient and their locks require two hands to operate (and they can’t be left unlocked). Also, moving these big bikes around the garage or parking lot isn’t easy. Both the Harley and Indian weigh in at 823 pounds, fully gassed. Despite weighing 39 pounds less, the Moto Guzzi feels massive. It requires the most effort to lift off its sidestand and, due to a steering damper mounted below the triple clamp that reduces wheel flop, the handlebar feels very stiff when moving it back and forth. And at a parking lot pace, the Moto Guzzi feels the most top-heavy and ungainly. To paraphrase John Muir, the road is calling and we must go! Lining up the bikes nose-to-tail clearly shows the relative sizes of their front wheels as well as the different shapes of their saddlebags. At stoplights, the V-twins that power these baggers rumble authoritatively. Dropping them into first gear is accompanied by a loud clunk, and each pulls away from a stop swiftly thanks to loads of low-end torque. 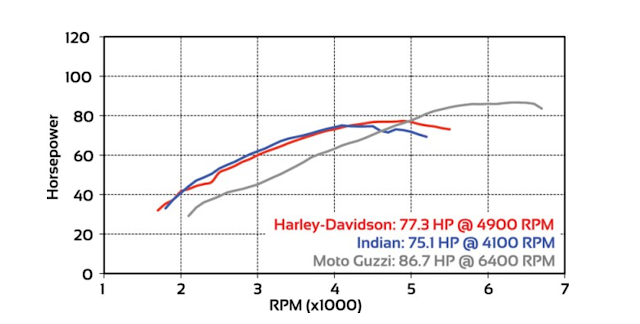 The 107ci Harley and 111ci Indian belt out more than 100 lb-ft of torque between 1,900 and 3,400 rpm, while the 84ci Moto Guzzi churns out about 80 lb-ft of torque from 2,300 to 5,500 rpm. The Harley and Indian prefer to be short-shifted while the Guzzi can be revved out more. Throttle-by-wire is the norm here, with good fuel metering and standard cruise control across the board. These bikes purr at highway speeds and feel tailor-made for wide-open spaces, but they have unique personalities. The Harley feels the most refined, the most responsive and does the best job of managing engine heat. The Indian is the torque king and has the most resonant rumble, but it also puts out a lot of heat and its exhaust can be loud. With its rev-me-up nature, multiple engine maps and muted sound, the Guzzi’s engine seems out of place on a bagger. The Jett Tuning dyno chart shows the horsepower differences, with the Moto Guzzi only coming out on top much higher in the rev range. Nimble handling may not top the list of criteria for many bagger buyers, but all else being equal, most of us prefer a motorcycle that feels graceful on a twisty, scenic road. The gyroscopic effect of the Guzzi’s 21-inch and the Harley’s 19-inch front wheels contribute to their overall stability (the Indian rolls on a 16-incher), but also make them more resistant to initial turn-in. All three have fork-mounted fairings packed with headlights, instrument panels and audio systems with speakers, which adds weight to the steering equation. 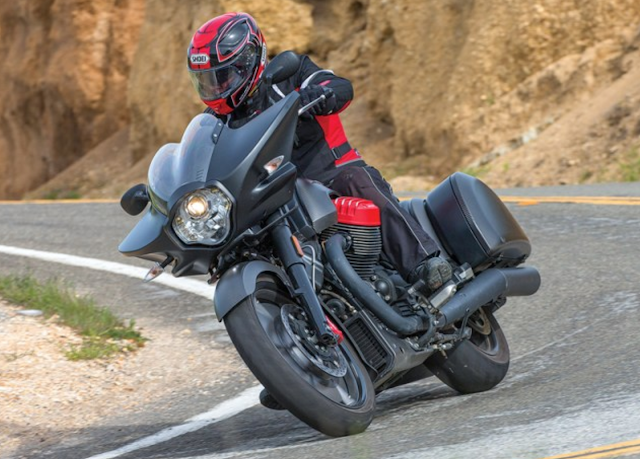 The Moto Guzzi’s handlebar is the widest, giving it plenty of steering leverage, but it’s also the farthest away from the rider, requiring stretched-out arms that put tension in the shoulders. Also, the combination of the MGX-21’s large front wheel and extended rake meant that we constantly had to muscle it through turns and never felt as comfortable or as confident as we did on the other two. Both the Harley and the Indian have handlebars that are closer to the rider for a more relaxed riding position, and both are less taxing when ridden on tight, technical roads. All three have strong triple-disc brakes with standard ABS. The Indian comes out on top in terms of torque, with a strong pull right off the line. These bikes’ fairings provide protection for the hands and chest, but with their short windscreens and lack of fairing lowers, windblast hits the rider above the shoulders and below the waist. Although the Moto Guzzi’s windscreen is more of a styling element than a functional one, airflow around the fairing is smooth. The windscreens on the Harley and Indian (the Indian’s is also electrically adjustable) deflect more wind than the Guzzi’s, but noise and turbulence can be issues on both bikes depending on rider height and prevailing conditions. Taller accessory screens are available for all three bikes. The profile photos above show the seating position of each bike, though bear in mind that all three riders are not the same size. The Harley (top) and Indian (center) have long floorboards that allow riders to adjust their foot position (though the Harley’s heel shifter limits space), and their dished seats are low and forward. The Indian’s handlebar is closest to the rider, followed by the Harley. The Moto Guzzi (bottom) has the most stretched out cockpit, with the farthest reach to the handlebar and a long, flat, tall seat. It’s the only bike here with footpegs, and its fairing is the farthest away from the rider and offers the least amount of wind protection. 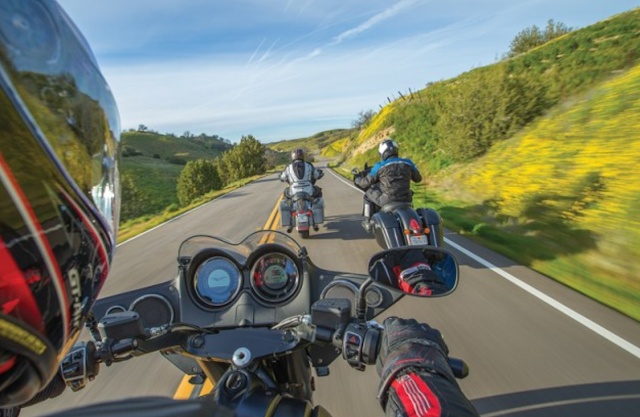 With their handlebars and fairings positioned closer to the rider and their spacious floorboards, the Harley and Indian have relaxed riding positions, though our tall test riders wished the seats allowed them to sit farther back. 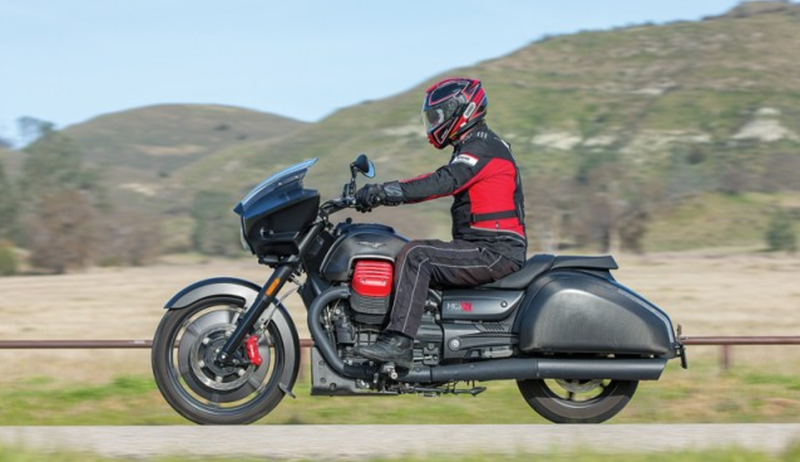 The Moto Guzzi feels the most stretched out, with a flat, supportive seat that’s also wide, making it harder to get flat-footed at stops since it’s the tallest at 29.1 inches (compared to 27 inches on the Harley and 26 inches on the Indian). Also, the Guzzi’s footpegs are positioned just aft of the protruding cylinders, which limits legroom. We answered the road’s call and enjoyed two days of back road exploration, with the hills pleasantly green thanks to steady winter rains. Each of these baggers strikes its own balance between style and functionality. With generous suspension travel ›front and rear and well-controlled damping, the Indian offers the best ride quality, hands down. Between the Harley and Guzzi, it’s a split decision. The Harley has the superior fork, a beefy Showa unit that offers excellent compliance, but its 2.1 inches of rear suspension travel—less than half that of the others—means that choppy pavement can be jarring. The Guzzi, on the other hand, has a fork that isn’t quite up to the task of dealing with its large front wheel and heavy fairing, while its rear shocks soak up bumps fairly well. The outcome of the comparison test surprised us. Given our past experiences with Moto Guzzis, we expected to like the MGX-21 more than we do. But its bold styling comes at the expense of handling and comfort, and except for cruising on straight highways, none of us warmed up to it. 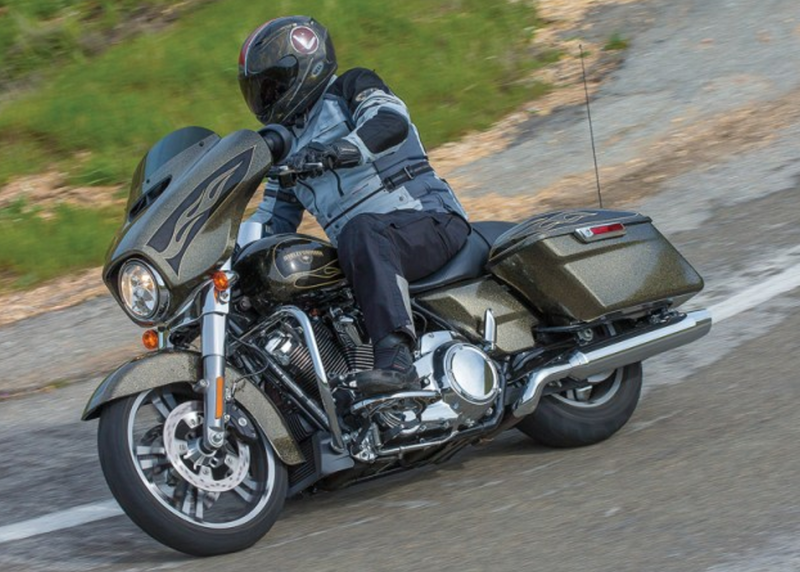 If you want a bagger with swagger that’s also enjoyable to ride, the choice comes down to the Harley or the Indian. 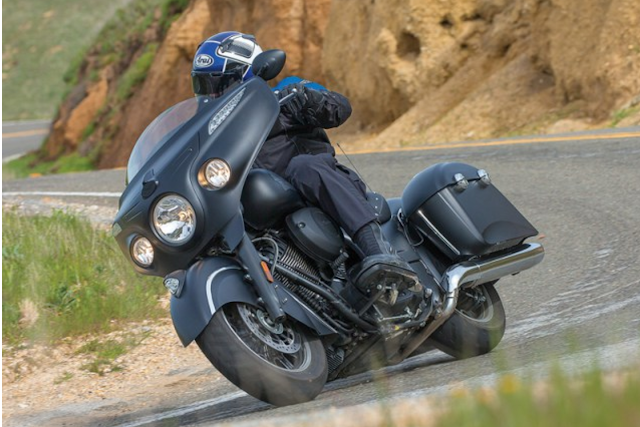 The Indian has the best chassis and suspension among V-twin touring cruisers, but its big, air-cooled engine, as torque-rich and satisfying as it may be, puts out too much heat. With its new Milwaukee-Eight engine and Showa suspension, as well as its timeless style and full complement of touring amenities, the Harley-Davidson proved to be best all-around bagger in this group. 2017 Harley-Davidson Street Glide Special. 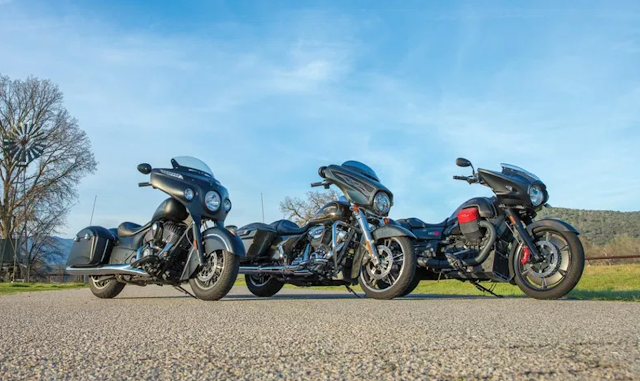 Like other Touring models in Harley-Davidson’s lineup, the best-selling Street Glide and Street Glide Special have been on a steady path of evolution over the past few years. Project Rushmore brought improvements in power, handling, safety, wind protection, comfort, convenience, infotainment and styling. For 2017, the big leap forward is the new Milwaukee-Eight 107 engine, which runs cooler thanks to precision oil-cooled cylinder heads, pumps out more torque and is smoother, quieter and more fuel-efficient. The air/oil-cooled, 45-degree V-twin displaces 1,746cc (107ci), has belt final drive and, on Jett Tuning’s dyno, made 77 horsepower at 4,900 rpm and 106 lb-ft of torque at 2,000 rpm at the rear wheel. It’s mated to a new assist-and-slipper wet clutch and a 6-speed transmission. Also new for 2017 is Showa suspension, with a non-adjustable Dual Bending Valve fork and a pair of emulsion rear shocks with a remote preload adjuster. 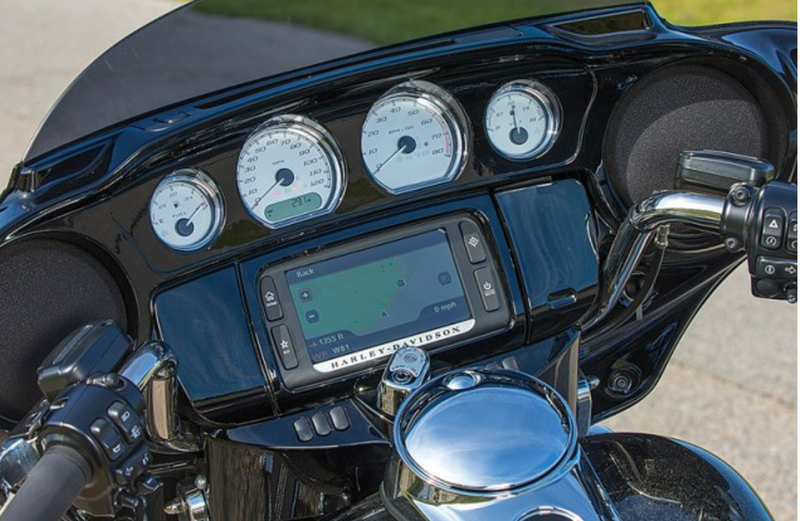 The Street Glide Special is the only bike in this comparison with a touchscreen infotainment/navigation system, though one is available on the standard Indian Chieftain. To the right of the screen is a media compartment with USB port. The white-faced analog gauges are classy and easy to read, and the inset LCD displays trip functions. The standard Street Glide has a base price of $20,999, and the Street Glide Special tested here, which adds the Boom! Box 6.5GT touchscreen audio/navigation system, Reflex Linked Brakes with ABS and Smart Security System, has a base price of $23,699. If you want something other than Vivid Black, basic colors add $500, custom colors add $1,200 and Hard Candy Custom colors, like the Black Gold Flake on our test bike, add $3,000. New for 2017 is Showa suspension, with a non-adjustable Dual Bending Valve fork and a pair of emulsion rear shocks with a remote preload adjuster. Valve Train: OHV, 4 valves per cyl. Lubrication System: Dry sump, 5.2-qt. cap. Charging Output: 625 watts max. Wheels, Front: Cast, 3.50 x 19 in. 2017 Indian Chieftain Dark Horse. 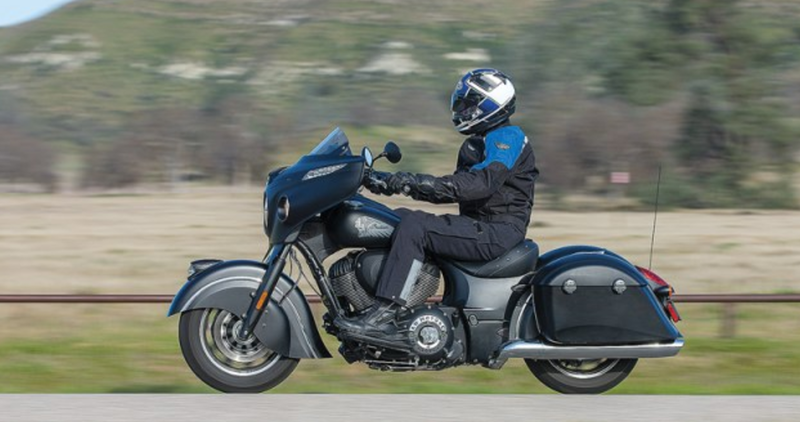 When the Chieftain debuted for 2014, it was the first hard fairing-equipped motorcycle to carry an Indian badge. With its Art Deco styling, integrated driving lights and electrically adjustable windscreen, the Chieftain’s handlebar-mounted fairing won’t be confused with that of any other bagger. 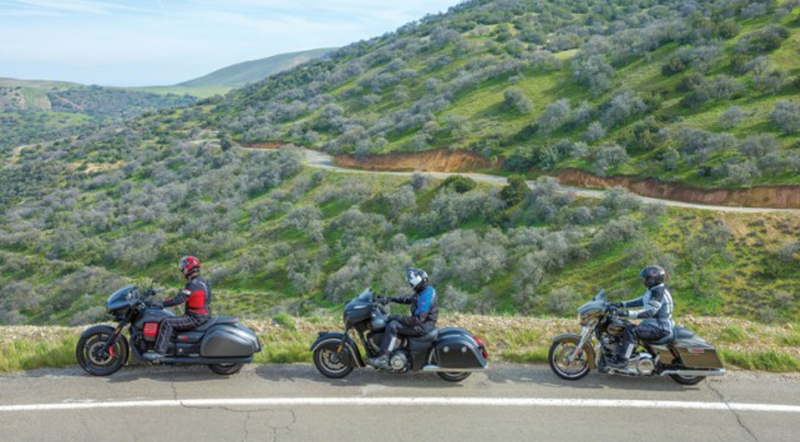 Backed by Polaris Industries, the reinvigorated Indian expanded its touring lineup, introducing the full-dresser Roadmaster for 2015 and the Chieftain Dark Horse for 2016. All are powered by the air-cooled, 49-degree Thunder Stroke 111 V-twin, which displaces 1,811cc (111ci), has belt final drive and made 75 horsepower at 4,100 rpm and 109 lb-ft torque at 2,400 rpm at the rear wheel. The wet clutch is cable-actuated and the transmission has six gears. 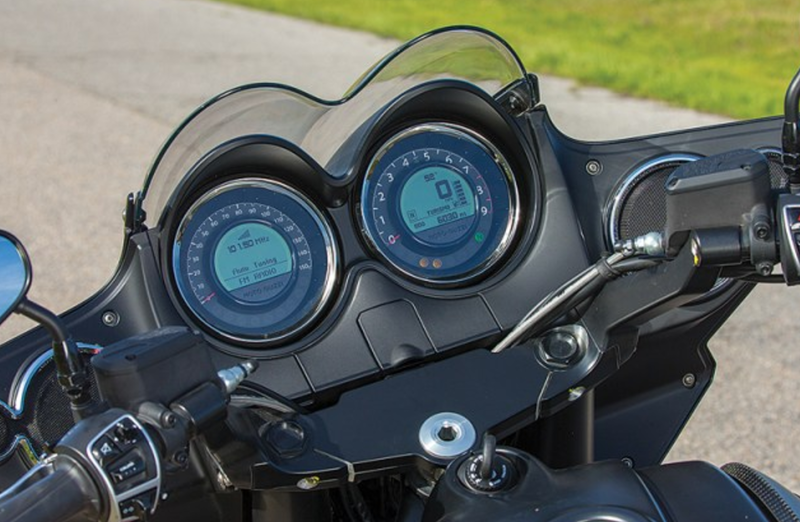 The Dark Horse’s central LCD display is info-rich (it includes tire pressure and much more) but can be difficult to read in bright sunlight. The touchscreen Ride Command infotainment/navigation system is only available on the standard Chieftain and Roadmaster models. Button on the right turns on the driving lights; button on the tank is for keyless ignition. 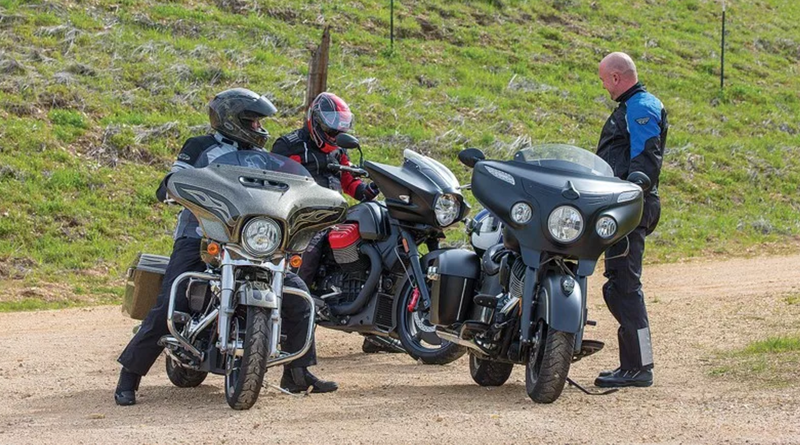 The Chieftain Dark Horse, which is only available in matte Thunder Black Smoke, has a base price of $21,999, and standard equipment includes ABS, tire-pressure monitoring, remote saddlebag locks, keyless ignition and an AM/FM/Bluetooth/USB audio system. 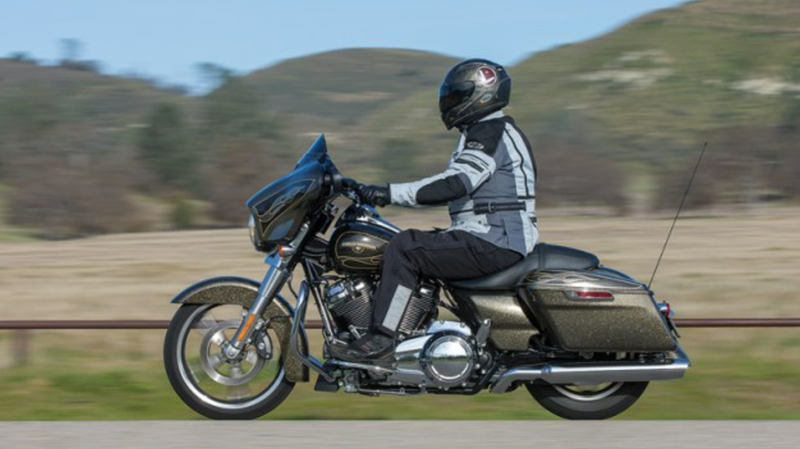 Stepping up to the standard Chieftain ($23,999-$25,199, depending on color) adds a passenger seat and pegs, a taller windscreen, highway bars and the 7-inch, touchscreen Ride Command infotainment/navigation system. Despite its hefty weight, the Chieftain Dark Horse was a pleasant ride on the twisty mountain roads. Charging Output: 812 watts max. 2017 Moto Guzzi MGX-21 Flying Fortress. Moto Guzzi named its big bagger after the Boeing B-17 that dropped more bombs than any other U.S. aircraft during World War II. An odd choice perhaps, but then again, the Italian manufacturer likes to do things its own way. Unlike the more traditional Harley-Davidson and Indian, with their V-twin cylinders arranged fore and aft around a transverse crankshaft, Moto Guzzi’s 90-degree V-twin has cylinder heads thrust out into the air on each side and a longitudinal crankshaft, which causes the MGX-21 to rock to the right side when the throttle is blipped at idle. With the smallest displacement in this comparison at 1,380cc (84ci) and a sportier state of tune, on the dyno the Guzzi posted the highest peak horsepower (87 at 6,400 rpm) but the lowest peak torque (82 lb-ft at 3,900 rpm). Power is sent to the rear wheel through a hydraulically actuated dry, single-plate clutch, a 6-speed transmission and a cardan shaft final drive. With the small speedo and tach needles hidden behind inset digital displays, they can be hard to see at a glance. The left LCD shows audio functions; the right LCD shows speed, fuel level, gear position and various trip functions. Behind the small door below the gauges is a USB port. The MGX-21 is a radically styled iteration of Moto Guzzi’s California 1400 cruiser line, which also includes the Custom, Touring, Audace and Eldorado models. Base price for the MGX-21 is $21,990, and standard equipment includes Brembo brakes with ABS, three engine maps (fast, touring and rain), three-level traction control and an AM/FM/Bluetooth/USB audio system. Yes, Virginia, that’s real carbon fiber. Valve Train: SOHC, 4 valves per cyl. Lubrication System: Wet sump, 4.3-qt. cap. Charging Output: 550 watts max. Wheels, Front: Cast, 3.50 x 21 in. Rear: Cast, 5.50 x 16 in.